For the magazine, see Musician (magazine). For the video game, see Musician (video game). "Instrumentalist" redirects here. For the philosophical position on science, see Instrumentalism. 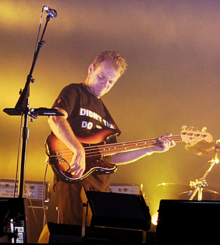 Guy Pratt, a professional session musician, playing bass guitar. A musician is a person who plays a musical instrument or is musically talented. Anyone who composes, conducts, or performs music is referred to as a musician. A musician who plays a musical instrument is also known as an instrumentalist. Musicians can specialize in any musical style, and some musicians play in a variety of different styles depending on cultures and background. Examples of a musician's possible skills include performing, conducting, singing, rapping, producing, composing, arranging, and the orchestration of music. "A chantar m'er de so qu'eu no volria"
Written by Beatritz de Dia. In the Middle Ages, instrumental musicians performed with soft ensembles inside and loud instruments outdoors. Many European musicians of this time catered to the Roman Catholic Church, and they provided arrangements structured around Gregorian chant structure and Masses from church texts. Renaissance musicians produced music that could be played during masses in churches and important chapels. Vocal pieces were in Latin—the language of church texts of the time—and typically were Church-polyphonic or "made up of several simultaneous melodies." By the end of the 16th century, however, patronage split among many areas: the Catholic Church, Protestant churches, royal courts, wealthy amateurs, and music printing—all provided income sources for composers. from George Frideric Handel's The Messiah. The Baroque period (about 1600 to 1750) introduced heavy use of counterpoint and basso continuo characteristics. Vocal and instrumental "color" became more important compared with the Renaissance style of music, and emphasized much of the volume, texture and pace of each piece. "Piano Sonata No. 8 in A minor"
Composed by Wolfgang Amadeus Mozart. Classical music was created by musicians who lived during a time of a rising middle class.[when?] Many middle-class inhabitants of France at the time lived under long-time absolute monarchies. [clarification needed] Because of this, much of the music was performed in environments that were more constrained compared with the flourishing times of the Renaissance and Baroque eras. "Piano Concerto No. 4 in G Major- Andante con moto"
Composed by Ludwig van Beethoven. The foundation of Romantic period music coincides with what is often called the age of revolutions, an age of upheavals in political, economic, social, and military traditions. This age included the initial transformations of the Industrial Revolution. A revolutionary energy was also at the core of Romanticism, which quite consciously set out to transform not only the theory and practice of poetry and art, but the common perception of the world. Some major Romantic Period precepts survive, and still affect modern culture. "3 Pieces for Clarinet Alone"
The world transitioned from 19th-century Romanticism to 20th century Modernism, bringing major musical changes. In 20th-century music, composers and musicians rejected the emotion-dominated Romantic period, and strove to represent the world the way they perceived it. Musicians wrote to be "...objective, while objects existed on their own terms. While past eras concentrated on spirituality, this new period placed emphasis on physicality and things that were concrete." The advent of audio recording and mass media in the 20th century caused a boom of all kinds of music—pop, electronic, dance, rock, folk, country and all forms of classical music. Musicians can experience a number of health problems related to the practice and performance of music. These can include tinnitus and noise-induced hearing loss, which occurs slowly and over a long period of time, and most musicians do not seek help until they start to experience secondary symptoms such as tinnitus (buzzing or ringing in the ears), distortion of sounds, diplacusis (hearing two different tones when stimulated by a single frequency), and hyperacusis (extreme sensitivity to everyday sounds). In addition, musicians are at increased risk for both musculoskeletal and vocal health problems when producing high sound levels on musical instruments. Increased biomechanical demands, whether at the hands, embouchure, or vocal cords, elevates the risks for occupational health problems like tendonitis, carpal tunnel, rupture of facial muscles, and vocal cord malfunction. ^ "Types of Musician". About MusicSchools.com. ^ "Music in the Renaissance". The Metropolitan Museum of Art. ^ "The Baroque Era". Oracle Education Foundation. Archived from the original on 28 April 2012. ^ "Unit IV 1750–1914". West Forsyth HS History. ^ "The 20th Century". Fine Arts Society Radio. Archived from the original on 11 June 2012. Retrieved 2 April 2012. ^ "Reducing the risk of hearing disorders among musicians". U.S. National Institute for Occupational Safety and Health. 1 July 2015. doi:10.26616/NIOSHPUB2015184. Look up musician in Wiktionary, the free dictionary. This page was last edited on 20 April 2019, at 06:51 (UTC).